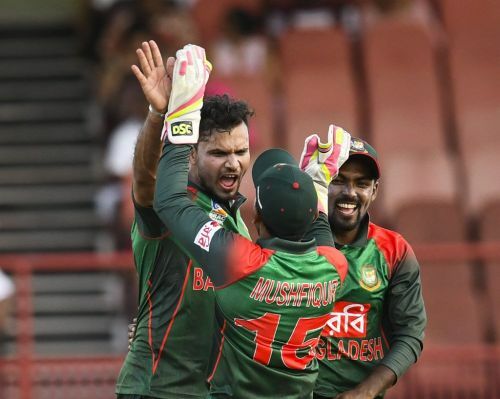 After blowing away the Windies in the longest format, The Tigers will look to continue their dominance in the limited-overs format, when they welcome the visitors in the first ODI at the Shere Bangla National Stadium in Dhaka on Sunday, December 9. Bangladesh and West Indies have played 29 completed one-day internationals against each other with the Windies leading 20-9. In their most recent clash in July 2018, Bangladesh got the better of the Windies to win the ODI series at Warner's Park. After electing to bat first, Bangladesh scored 301 and then restricted the Windies to 283 to win the game and series 2-1. Bangladesh are coming into this series on the back of a comprehensive win in the Tests and will look to maintain the momentum. The comeback of Tamim Iqbal will certainly boost their strength and the opener boasts a strong record at Dhaka with five centuries and 16 fifties to his name. He was Bangladesh's key performer in the previous ODI series against the Windies as he ended the series with 287 runs in three matches and will be eager to replicate that form in his comeback game. Imrul Kayes topped the runs charts with 349 runs in the previous home ODI series against Zimbabwe. Mushfiqur Rahim too has been amongst the runs and these two will be key figures at the top. Shakib Al Hasan is not only one of Bangladesh's best batsmen but also one of their best bowlers. He has the most ODI wickets at this ground - 112 in 78 matches. Mashrafe Mortaza finished as the highest wicket-taker in the previous series against the Windies with seven wickets including a four-wicket haul in the opening encounter. Mehidy Hasan and Mustafizur Rahman are two other bowlers in the side who are likely to cause problems for the visitors. Mehidy finished as the best bowler in the Test series with 15 wickets and the off-spinner is expected to give the West Indian batsmen plenty of headaches. Mashrafe Mortaza (C), Mustafizur Rahman, Nazmul Islam, Tamim Iqbal, Imrul Kayes, Mushfiqur Rahim, Mohammad Mithun, Shakib Al Hasan, Mahmudullah, Mehidy Hasan, and Mohammad Saifuddin. West Indies have not fared too well in the fifty-over format of late, losing eleven and drawing one of their last twelve bilateral ODI series. They are coming into this series on the back of a 3-1 series defeat against India and will begin this series as underdogs. Shimron Hetmyer (707 runs in 15 matches) has scored the most runs for Windies in 2018 and was also the leading run-getter in the preceding Test series. He can be a danger man if not dismissed early on. Shai Hope, the team's biggest asset, has been their second best batsman this year with 578 runs. Hope displayed his potential in the previous ODI series against India and he along with Kieran Powell are expected to make strong contributions in this match. West Indies' bowling mostly revolves around Kemar Roach, Carlos Brathwaite and Devendra Bishoo. Roach has 13 wickets in six ODIs at this venue and he along with Brathwaite will look to hurt Bangladesh with a few early breakthroughs. Bishoo was impressive in the Test series finishing with seven wickets and the skipper will back the leg-spinner to replicate his form in the ODIs. Rovman Powell (c), Darren Bravo, Shai Hope, Marlon Samuels, Shimron Hetmyer, Carlos Brathwaite, Keemo Paul, Devendra Bishoo, Kemar Roach, Oshane Thomas and Kieran Powell.